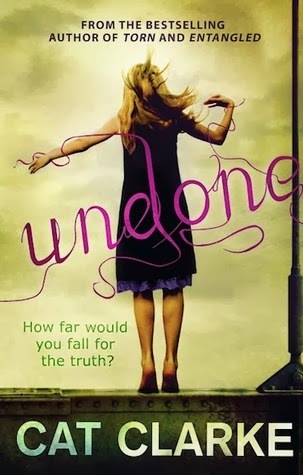 Omigosh, I just read the description of UNDONE over at GoodReads and it sounds AMAZING. Heartbreaking, but amazing. I'm definitely not a "look at the ending" type of person, UNLESS it's a DNF and I still want to know what happens at the end, but that's pretty rare. That being said, I definitely don't mind doing re-reads (in fact I really like it), because I forget the small details of books a lot. For re-reads it doesn't bug me that I know where the story ends up, because I'm getting to experience the characters and the nuances of the plot from another perspective. @Kristan...yes, the description hooked me and, though it broke a lot of "rules," I ultimately really appreciated the storytelling. It's cringeworthy, heartbreaking, heartwarming, and definitely worth reading! @Ashley...thanks so much for always sharing a comment! It's okay that you're not so Spoilery...ultimately it leads to more Book Wonder. :) So glad you're a re-reader because the same guy who was appalled that people read endings said he doesn't re-read. To me, that's mortifying! I don't like spoilers, but I think some books are more ruined by spoilers than others, if that makes any sense. I can stand being spoiled for a romance more than I can regarding a mystery. I very rarely DNF as well, but I think that's mostly due to how many of my reads are initially vetted by the book blogs that I read. Good luck with your writer's group! Hopefully they get over their book snobbery.